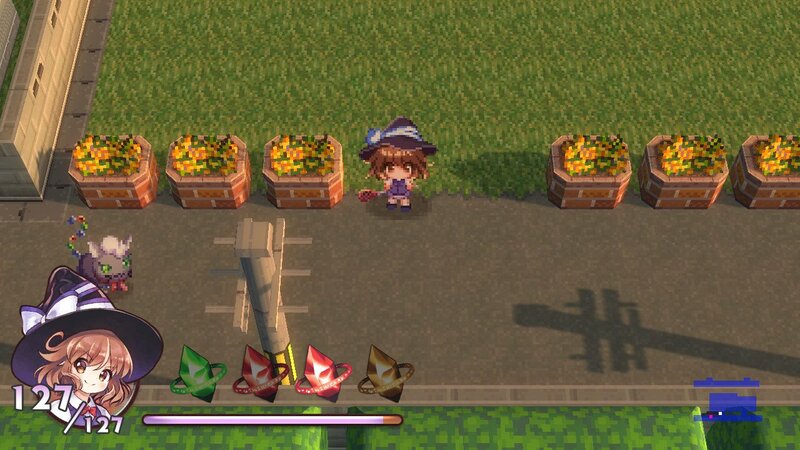 As Sekai Project works to increase their console output, the first game to come out for the Switch is a console port of the 2016 PC rogue-like RPG, A Magical High School Girl developed by illuCalab. 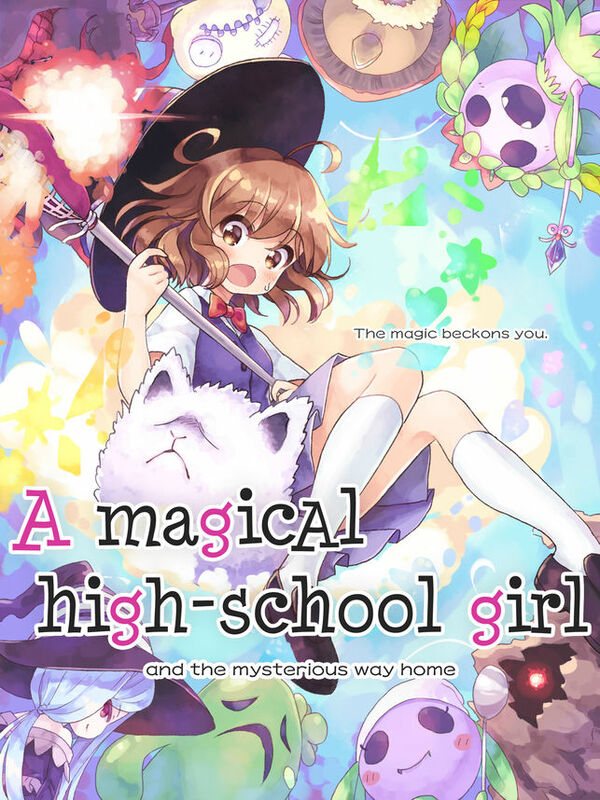 It boasts a retro visual style and setting based on a high school girl who must get through magical mazes that are set in an alternate realm on her way home from school. In this review, we will look at this game. 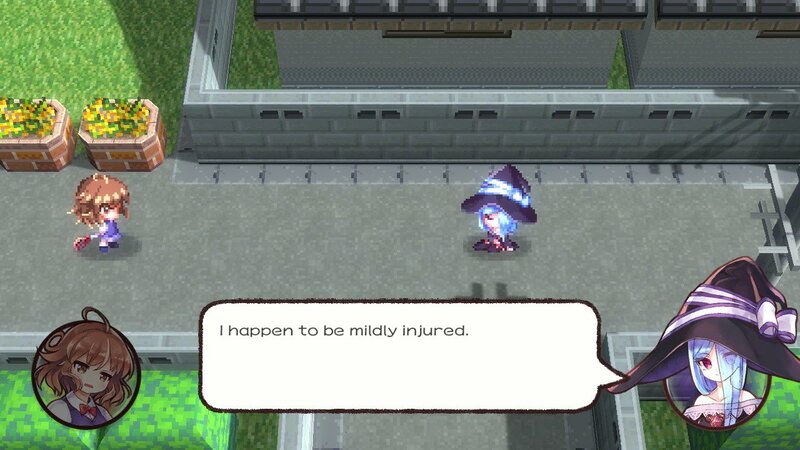 The story involves this blue haired heroine whom the protoagonist keeps running into during her adventure. A Magical High School Girl looks and plays the part. The retro art style is charming and fits the environment of the game well. 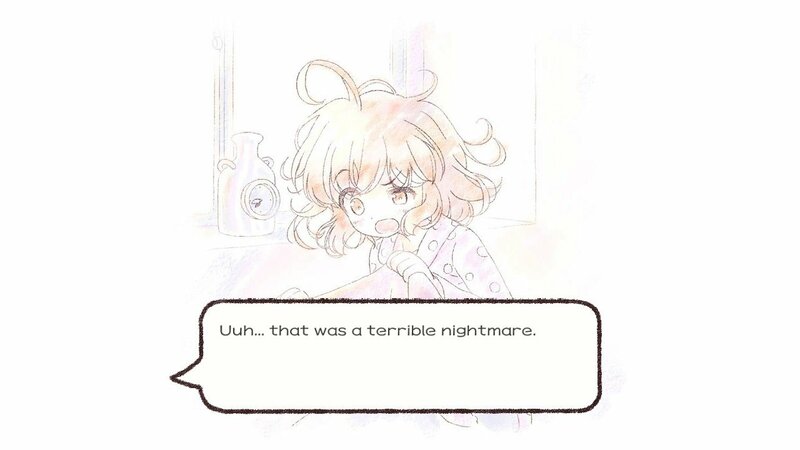 The moe illustrations that are drawn for the visual novel-style cutscenes are equally appealing. The music is also good but lacks variety, hence you hear the same themes over and over which begins to get tedious after a while. Gameplay-wise it plays like a typical rogue-like. The control scheme on the Switch is good and responsive. The floor design has a strong element of randomness including in the floor maps (whereas in other games like Shiren the Wanderer 5 there tended to be less variation on dungeon maps). I didn’t encounter any bugs during my time with the game, leading me to believe Sekai Project did a good port of the title. There is also a fair amount of enemy variety with each enemy having their own strengths and weaknesses alongside movement patterns. The sunset pallette here is quite nice. On the other hand, the spell naming mechanic is a mixed bag. This is where if you collect an anonymous magicite, you are able to type the name of your spell and it will transform into a usable spell within the game. On the positive side, there are many possible combinations to choose from and when equipped with the right spells, you’ll be able to face the enemies in this game head on. However, many of the spells that you name don’t always come out with what you expect them to. 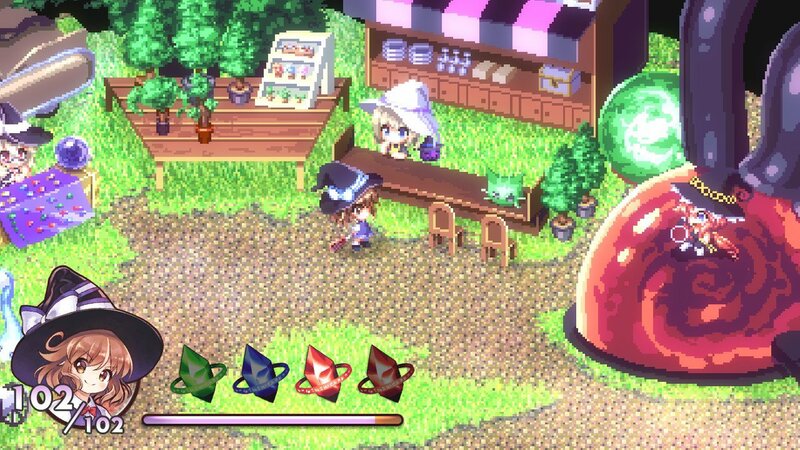 For example, to cure the gag status effect, “Anti-Gag” and “Anti-Gagged” will produce completely different spells and not cure the gag status effect as the name suggests. One of the better spells in the game’s magicite system is the ability to summon other allies to essentially act as punching bags for the enemies. Because of this, the best way to take advantage of this system is to look through the handful of guides already out there as this system is too inconsistent with its execution and you will waste a lot of magicite as you try to find the right spells. Likewise, if you are struggling to progress, looking up guides to learn certain spell names for what you want to do (ie. “Anti-Map” to map the floor you are on) would also be helpful to help increase your chances of survival as the game won’t tell you this. The Witch’s Village is home to a few facilities such as an item shop that can help you on your journey. The game is very hard and frustrating and there is little in the way of accessibility features such as difficulty levels. There is a lot of trial and error required for this game and a huge element of luck. While this is a common element of rogue-likes, it felt a bit too unnecessarily difficult in the context of this game. 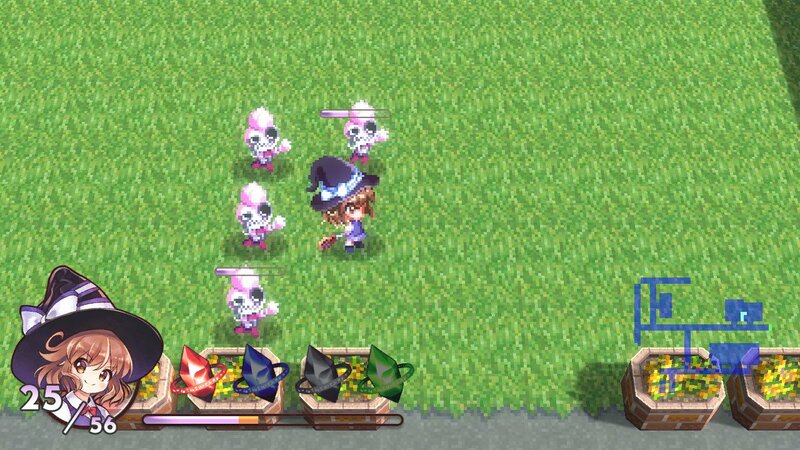 There are lot of enemies who are overpowered and require certain types of spells to defeat. Fortunately, these weaknesses can be guessed but this does take time. The saving grace for me is the fact you can warp to every fourth floor per dungeon which is what made this game become doable for me for the most part. Unfortunately, this game became too difficult and frustrating for me right near the end of the main story, and alongside other stressful life issues that took my attention, I couldn’t finish the game. This is the screen that appears when you collapse in a dungeon. You will see this a lot. When A Magical High School Girl is fair, it’s fun. It’s a solid game for the price of $14.99 with some caveats that I mentioned above. It’s a good doujin rogue-like RPG and I did enjoy my 25 hours with the title. Hopefully we will see more games from illuCollab and Sekai Games in the future.